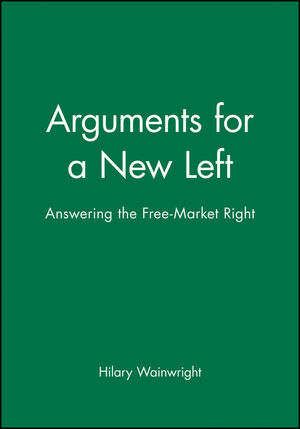 As disillusion sets in with the free market right- the legacy of Thatcher, Reagan and Geoffrey Sachs-Hiliary Wainwright retrieves and develops what was best in the thinking and practice of the new left. Challenged by the appeal of neo-liberalism to young organizers in the civic movements of Central Europe, she tackles Hayek's critique of the all-knowing state, and his regonition of 'practical knowledge' that no state or party can secind guess. Drawing an alternative view of knowledge from the practice of social movements (from the 1968 student revolt, through militant shop stewards organizations and the women's movement, to green activism of the 1980's) as well as from new philosophical currents, Wainwright counters Hayek's individualism and denial of the legitimacy of the collective action, with a conception of knowledge as fundamentally social.On this foundation she establishes a new understanding of transformative political agengy as well as self-consciously experimental and involving a combination of representative and participatory forms of democracy. Arguments for a new Left is sure to provokr wide discussion. Hilary Wainwright is Senior Research Associate for the International Centre for Labour studies at Manchester University. In 1991 she was a Visiting Scholar at the University of California, LA. Her previous books include Labour: A Tale of Two Parties and (with Sheila Rowbotham and Lynne Sega) the classic Beyond the Fragments. The arguments: A New Left and the Democratization of Knowledge. Part I: An Eastern Challenge to the Western Left:. 1. Encounters in the New Europe. Part II: At The Heart of the Challenge:. 2. Frederick Hayek and the Social-Engineering State. 4. TheTheory and Politics of Knowledge. Part III: New Kinds of Knowledge for new Forms of Democracy:. 5. From Social Movement to Self Management: A case Study from the Women's Movement. 6. From Grass Roots Organizing to New Economic Networks. 7. From Extra-Parliamentary Oppositions to Parties of new Kind. Part IV:Why Movements Matter in the New Europe: . 8. Ending the Cold War. Directory of International Campaigns, Networks and Newsletters. "When one of Britain'smost dedicated and resourceful activists writes with this vision and energy, one is compelled to listen closely." Terry Eagleton. "Hilary Wainwright is unique for her ability to synthesize academic analysis and the practical concerns of movement politics." Francis Fox Piven.